I had a briefing with TIBCO on their Spotfire 4.0 release, announced today and due to be released by the end of November. Spotfire is the analytics platform that TIBCO acquired a few years back, and provides end-user tools for dimensional analysis of data. 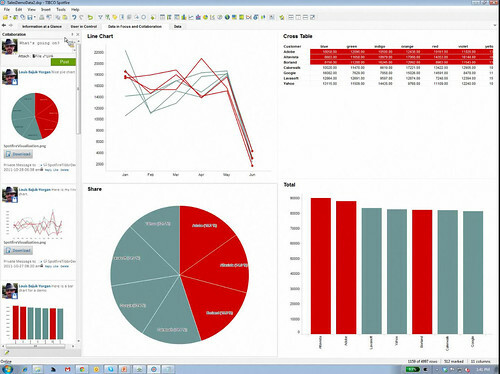 This includes both visualization and mashups with other data sources, such as ERP systems. Analytic dashboards for monitoring and interactive drilldowns. This seems more like the traditional BI dashboards market, whereas Spotfire is known for its multidimensional visualizations, but I expect that business customers find that just a bit too unstructured at times. Social collaboration around data analysis, both in terms of finding contributors and publishing results, by allowing Spotfire analysis to be embedded in SharePoint or shared with tibbr, and by including tibbr context in an analysis. I did get a brief demo, starting with the dashboards. This starts out like a pretty standard dashboard, but does show some nice tools for the user to change the views, apparently including custom controls that can be created without development. The dynamic visualization is good, as you would expect if you have ever seen Spotfire in full flight: highlighting parts of one visualization object (graph or table) causes the corresponding bits in the other visualizations on the screen to be highlighted, for example. There’s also some built-in collaboration: a chart on the Spotfire dashboard can be shared on tibbr, which has a static snapshot of the chart shared in a discussion thread but links back directly to the live visualization, [Insert obligatory iPad demo here] whereas sharing in SharePoint embeds the live visualization rather than a static shot. Embedding a tibbr discussion as context within an analysis is really less of an integration than just a side-by-side complementary viewing: you can have a tibbr discussion thread viewed on the same page as part of the analysis, although the tibbr thread is not itself being analyzed. I found that the integration/collaboration was a bit lightweight, some of it no more than screen sharing (like the difference between a portal and a composite application). However, the push into the realm of more traditional dashboards will allow Spotfire to take on the more traditional BI vendors, particularly for data related to other TIBCO products, such as ActiveMatrix BPM.